A political dispute with the State of New Jersey is threatening to dismantle the Camden Children’s Garden, a green safe haven and community hub amidst what the USDA calls one of the worst food deserts in the country. The Camden City Garden Club, a nonprofit, runs the 4.5-acre Camden Children’s Garden and also supports 120 community gardens in Camden, creating $2.3 million in fresh produce each year. The Children’s Garden is the main hub of CCGC’s business, where they provide trainings, educational programs, and attractions such as the year-round Butterfly House (built with the Philadelphia Eagles), Benjamin Franklin’s Workshop, and a carousel. 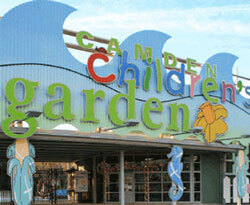 Fourteen years after its creation, and after consistent support from the City Council and recent Governors, the State of New Jersey has laid claim to the waterfront property and attempted to evict the Camden Children’s Garden on March 31. The State informed the CCGC that it owns the land on which the garden sits and plans to give it to Herschend Family Entertainment, the for-profit company that now owns the Adventure Aquarium next door. Repeated attempts to contact the State Treasury and Division of Property Management and Construction were unsuccessful. Mike Devlin, CCGC’s Executive Director, says the State is “taking away an economic development project that was planned by the community and giving it to a for-profit company [based in another state. ]” CCGC’s employees are 80 percent Camden residents and according to a University of Pennsylvania study, they have helped feed 12 percent of the population in Camden with fresh produce. The CCGC has invested $12 million of grants, donations, and member dues into the Camden Children’s Garden, which would be handed over to the Adventure Aquarium should the State win this battle. CCGC volunteer Anthony Calabretta calls it a “power grab against a fairly defenseless organization, [that came years] after they started operations.” The CCGC seeks continued support from foundations, charitable groups, and local residents. Devlin asks concerned citizens to demand of the State, whether it should support an organization that is by the people, for the people, or an out-of-towner’s bottom line. KATY DIANA is a freelancer, poet, and gardener whose work has been published in Philadelphia Stories, the Pennsylvania Gazette, Culture Mob, and Northern Liberties Review.